For adventure lovers we have came up withe a beautiful package tour, which combines adventure activities, trekking and sight seeing wrapped in one short tour as you will get to explore most beautiful destinations of Kangra in a tiny weekend tour. You will experience the magical valley of Barot. The ancient villages and enchanting landscapes of Badagran, Rajgundha and KukkarGundha. Enjoy Angling on the gushing waters of the river UHL. Spend your weekend over bonfires, pictures, rock climbing, river crossing and rappelling over a waterfall. Relish Mutton and Trout Fish of Barot. Vegetarians can also feast on the famous Potato khatta sabzi, Rajmah and Gobhi of Chotha Bhangal Region. Cross the Uhl river over a small wooden bridge, enjoy chilling bath under the waterfall in the pool of Badagran and enjoy camping at Rajgundha (2500 meters), Paragliding at Billing (2400 meters). Explore magnificent monasteries of Bir (1500 meters) and relish Tibetan Food at it's best. In the afternoon explore temples like Baijyanath, Mahakal and Vindhyavasini and have a beautiful walk along Tea Gardens of Palampur and enjoy snacking on the banks of gushing Neugal River before catching your volvo from Palampur or train from Pathankot. Have some tea with fene at Teashop of Rakesh and and then proceed for the short trek to Rajgundha through the village and it's old wooden houses and friendly inhabitants. After descending down and crossing the river UHL on a wooden bridge there is an climb upwards from there along a nullah as you reach Twin Villages of Rajgundha and Kukkar Gundha on the opposite side of the cliff. Enjoy the views of the beautiful valley and catch a peek of the Snow Clad Dhauladhar Ranges surrounded by dense forest of Deodar. Enjoy the hospitality of the villagers while appreciating the charm of the ancient village and its traditional houses giving you a feeling of being in a different world. After some snacks and a short stroll nearby we will proceed for our trek towards Billing on a comfortable and level but not well maintained road, Alternatively we can also plan to camp and stay at the nearby guest house or in tents amid stars, bonfire, good music and freshly cooked delicious food. Billing (2400 meters), is a 3 hours level walk from Rajgundha (2500 meters). The region is full of terrace farms hanging over the mountain slopes. We cross Chinna Pass and its small temple as we walk and leisurely explore the beauty of Chhotha Bhangal while passing through Rhododendron, Oak and Pine Forests. As one approaches Billing and have a glimpse of the paragliding site from a height and distance. 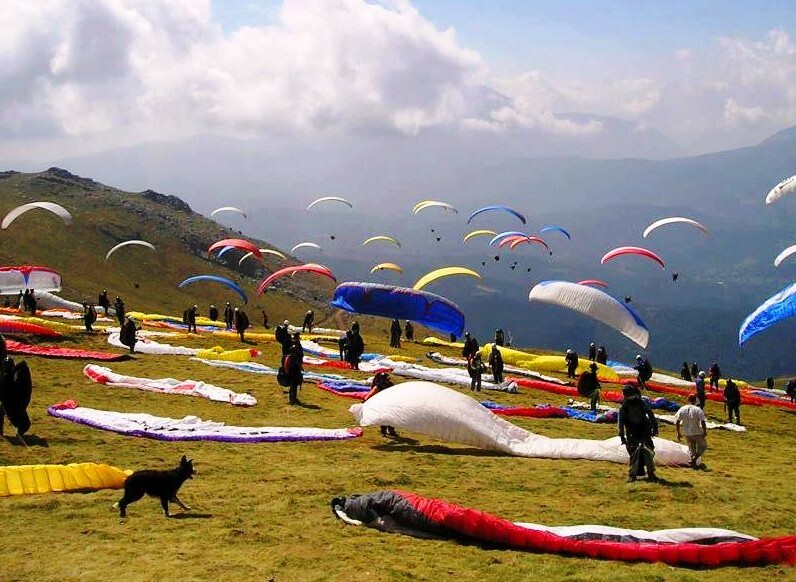 One could not help but appreciate the magnificence of the valley and get enticed learning the fact that we are descending downwards towards one of the highest paragliding sites in India. The feeling is just awesome. We come across beautiful scenery and layers and layers of mountains and breath-taking views of the valley and deep gorges till we reach the world's most coveted paragliding site of Billing situated at 2400 meters. Take a shot at paragliding as you jump down 1000 meters on a paraglider and enjoy 30 minutes of adventurous ride, which is undisputedly the best paragliding experience in India and land at the open grounds of the landing site at Bir (1500 meters). In Bir, enjoy the delicious Tibetan Thukpa and Momos or choose delicious most amazing Paranthas and do some shopping and collect souvenirs from the numerous shops. Take a monastery tour and visit Nyngma and Sherabling. Visit the famous Baijyanath Temple which is one of 12 Jyotirlingas of Lord Shiva and the spot where King Ravana offered his ten heads to Lord Shiva. Pay obeisance to the almighty Lord and head towards the beautiful tea-garden city of Palampur. Enjoy a leisure walk among the beautiful tea gardens spread across both sides of the road and enjoy some chow mien or Momos on the banks of gushing Neugal River and a boat ride in Saurabh Van Vihar, named after Captain Saurabh Kalia the brave Soldier of the Kargil War. This beautiful park is maintained in his memory and is an attraction for tourists visiting Palampur.